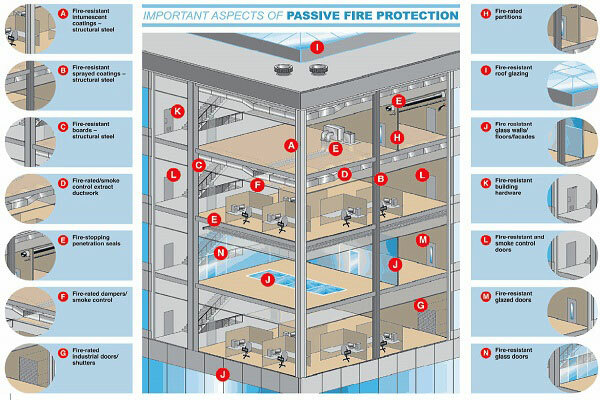 Passive fire protection (PFP) is an integral component of the three components of structural fire protection and fire safety in a building. PFP attempts to contain fires or slow the spread, through use of fireproofing paints, fireproofing materials, fire-resistant walls, floors, and doors (amongst other examples). PFP systems must comply with the associated listing and approval use and compliance in order to provide the effectiveness expected by building codes. Passive fire protection measures are intended to contain a fire in the fire compartment of origin, thus limiting the spread of fire and smoke for a limited period of time, as determined the local building code and fire code. Passive fire protection measures, such as firestops, fire walls, and fire doors, are tested to determine the fire-resistance rating of the final assembly, usually expressed in terms of hours of fire resistance (e.g., ⅓, ¾, ۱, ۱½, ۲, ۳, ۴ hour). A certification listing provides the limitations of the rating. fireproofing cladding (boards used for the same purpose and in the same applications as spray fireproofing) Materials for such cladding include perlite, vermiculite, calcium silicate, gypsum, intumescent epoxy, Durasteel (cellulose-fiber reinforced concrete and punched sheet-metal bonded composite panels), MicroTherm.